Melbourne designer Shannon Lamden has been hard at work making lots of new goodies to fill her Etsy store. New fabrics, art prints, too-cute softies, and decorative fabric hoops to brighten up your walls... 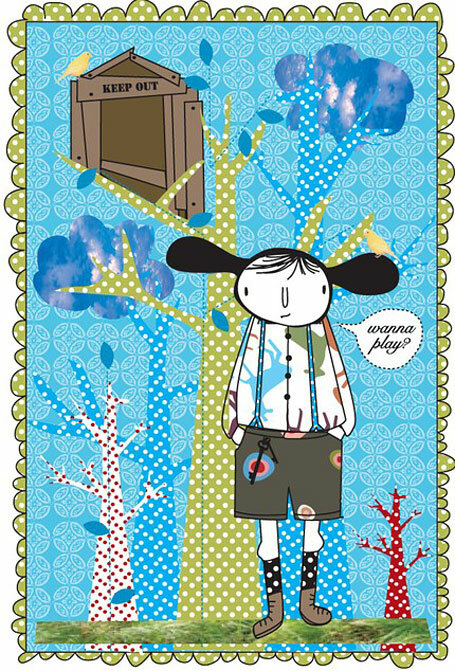 The colourful & light-hearted "Wanna Play" limited edition digital print is pictured above (US $12). Who wouldn't want to venture outside into this garden? 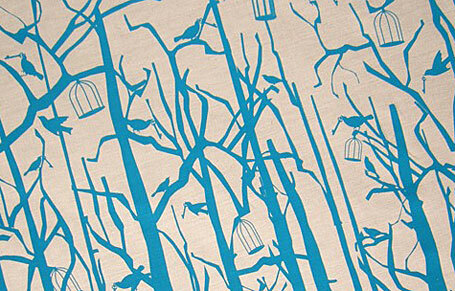 Shannon has introduced linen prints to her crafty fabric lineup. These can be mounted on canvas & hung or framed, or even sewn into a quilt as a decorative panel. 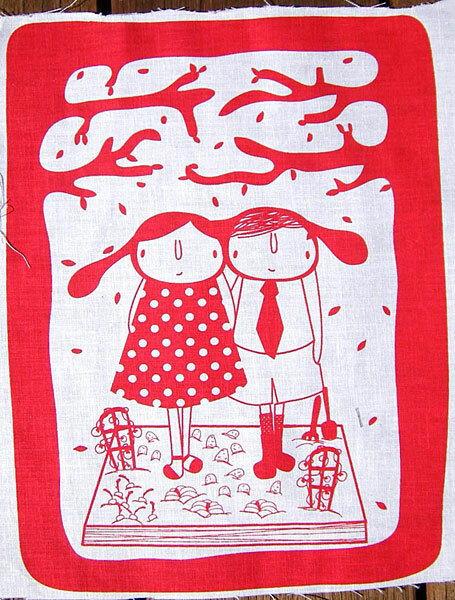 "In The Garden" features a sweet & smiling, vegie lovin' couple holding hands in their vegie garden. It is available in red (above, US $22), black, blue & green and measures 22cm x 30cm. Aunty Cookie Fabric Softies! Look how gorgeous these girls are - each clutching her three pet owls! 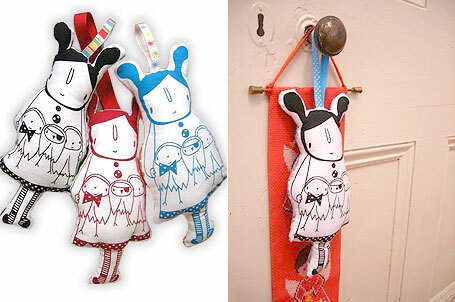 Shannon has brought her illustrated characters to life (with the help of a little softie stuffing & ribbons). The Cookie character is hand screen printed onto cotton drill, and backed with printed fabric - some spotted, some vintage. At US $18 each and approx. 22cm in height, they are perfect for little hands to hang onto. Shannon is well known for her limited edition hand screen printed fabrics, and pictured above is one of her new prints, "Home Sweet Home" in teal & olive on birch linen (above, US $18). 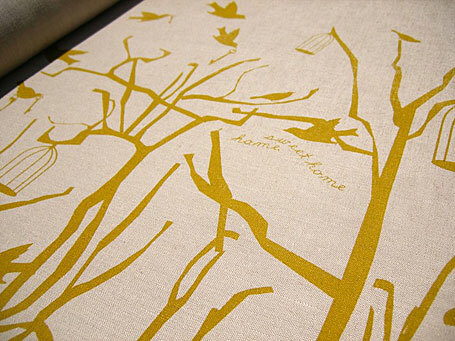 This print is also available in either mustard or cherry printed onto chocolate brown linen. I know I've told you where to find Aunty Cookie products before, but in case you'd like a reminder, stockists include: Patchwork on Central Park, Arthurs Circus, Cocoon, Meet me at Mikes, Duckcloth, One Small Room and of course Aunty Cookie at Etsy. For snippets of what goes on behind the scenes, & updates which are always entertaining, check out Shannon's blog at www.auntycookie.com.